With UN climate negotiations in something of a quagmire, you might assume that fewer and fewer governments were passing national legislation on the issue. According to a report just out from Globe International, the parliamentarians' alliance, you'd be mistaken. Compiled in association with the Grantham Institute, the London-based climate think-tank, the report doesn't simply list climate laws. Instead it analyses legislation in 16 of the world's major economies (15 countries plus the EU), including established powers such as the UK and Russia and emerging players such as Mexico, South Africa and Brazil. One of their top-line conclusions is that most of the laws have been passed within the last 18 months - giving the lie to any notion that glacial progress on a new international agreement has caused governments to think again. You might ask "so how do you define a law as climate legislation?" given that emissions can in principle be altered by a huge number of things - building schools closer to where pupils live, taxes on meat, encouraging flexible working... just about anything, in fact, could have an impact. So selection criteria could be an issue; nevertheless, reading the entries for different countries does give a strong sense of what's happening, and of the legislative processes in the various capitals. And there are some interesting comparisons. The analysts divide climate legislation into seven main areas: carbon pricing, energy efficiency, renewables, forestry, other land use issues, transport, and adaptation to climate impacts. Perhaps reflecting concern over the security of future energy supplies, the only category in which all 16 economies have all established policies is efficiency. The only three countries to score a tick in all seven categories are Asian - Indonesia, Japan and South Korea. "...the number of laws relating to climate change is not a reliable indicator of the comprehensive nature of a given country’s legislative response. Some laws are integrative whilst others are very narrow in scope." By comparison, a relatively recent entrant - South Korea - has fairly comprensive legislation stemming largely from its espousal of "green growth". The US, as you'll know if you follow this stuff even in a cursory way, is a long way away from enacting comprehensive climate legislation, and apparently getting further away every month. "Although the passing of energy and climate change bills through Congress amount to a time‐consuming and complex process, US legislation on the issue tends to be rather comprehensive, precise, and with clear financial commitments and monitoring mechanisms. "Additionally... the Senate Committee on Energy and Natural Resources saw over 30 bill proposals relevant to tackling climate change introduced for its consideration in 2009‐2010. "Finally, it is useful to note that although this project covers federal legislation only, there is a myriad of policies and legislation on climate change at the state level." "It is my view that an effective post‐2012 climate change agreement will only be possible when countries are already taking the necessary domestic action, firmly rooted in their own national interest. "In other words, an international agreement will only reflect the political realities in the major economies, not define them." You might find an implicit criticism therein of the UN climate process, which is posited on the idea of a negotiated agreement in which countries first agree the scale of the problem and then assign themselves fair, equitable shares of pain incurred in its solution. Lord Deben's analysis might not find favour with countries most vulnerable to climate impacts, nor with some activists. But given the nature of the outcome from 2009's Copenhagen summit, it's hard to argue with his analysis of the political reality. Still, in this picture, governments have to feel there's reason enough to enact this kind of legislation; what might persuade them? Well, some types of legislation clearly come with side benefits - energy efficiency being the most obvious example, with forestry not far behind. But cross-referencing the Globe study with the recent Pew Environment Group analysis of investment in renewables, it appears that there's something of a correlation between countries with active climate legislation and those that are attracting the cash for wind, solar and so on. Perhaps that's not a surprise; but it is an economic reality. One other aim of the Globe report is simply to help governments compare their relative situations and learn from each others' approaches. Will it have any impact? We will only know by following the volume and the nature of climate legislation passed over the next few years. In a week when the introduction of species to islands has been under discussion for other reasons, news comes from Mauritius of a new inhabitant that is restoring a vital piece of long-extinct ecology. And it centres on a tortoise. Several hundred years ago, settlers wiped out the big wildlife from the Ile aux Aigrettes, a small island off the Mauritian coast that's now a nature reserve. Vanished creatures include a giant tortoise of the Cylindraspis genus and Leiolopisma mauritiana, the largest skink in the world while it still existed. So far, so bad - but so familiar. What might not been have anticipated was the impact on one of the island's most important trees, a species of ebony (Diospyros egrettarum). 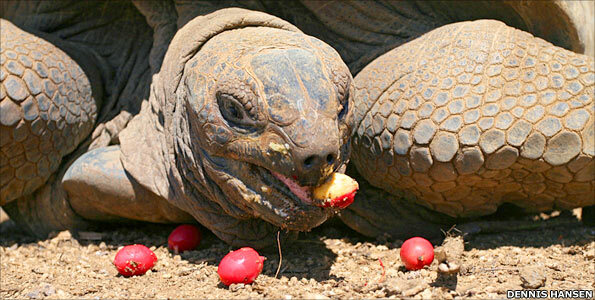 The giant tortoises, and maybe the skinks too, would eat fruit from the ebony trees as it lay on the ground. The animals would then waddle away; so when the fruit emerged some days later at their nether end, it was now some distance away from its parent tree. So just as the forest was essential for the tortoise's survival, the reverse is also true. And without the giant seed-dispersers, egrettarum's capacity to spread itself around Ile aux Aigrettes has become so compromised that the species is now listed as Critically Endangered. It's not the only issue threatening them - chopping valuable ebony trees down hasn't helped, and neither has the introduction of plants from outside the island - but without their carapaced companions, the ebony fruit and the seeds they contain can only fall under existing trees, with no chance of spreading further afield. A group of scientists headed by Christine Griffiths from the UK's University of Bristol decided to attempt something a bit radical; stocking the island with another giant tortoise. And in the journal Current Biology this week, they relate what happened. Essentially, it's a good news story. 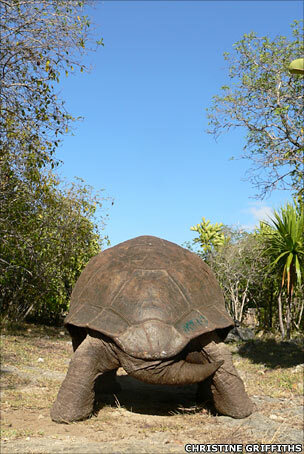 The tortoises - Aldabrachelys gigantea, one of the largest species in the world - were imported from fairly close by, the Aldabra atoll in the Seychelles, and appear to live happily in their new home. They have been eating the ebony fruits and dispersing them over large distances, which should help the trees' recover something of their former range. And the researchers discovered another important role that the tortoises play. Passage through their digestive system strips some of the fruit away, meaning that the seeds within it germinate much faster after they hit the ground - perhaps meaning that more seeds germinate in total. As we've discussed here (and thanks for all your incisive comments on that thread), introducing new species to islands isn't something to be done lightly. But as the researchers point out, here they were using a species very similar to the one that disappeared; plus the tortoises are so big and so slow-moving that if anything does seem to be going wrong, they can be plucked out of the ecosystem again. The team also cautions that longer-term observation is needed because there are also introduced plants on Ile aux Aigrettes; and what impacts the tortoises may have on them is an unknown, as presumably the twain will not previously have met. At some point down the road, I guess, an ethical decision will have to be made. Do the tortoises stay, or go? Deciding the former implies a judgement that overall, the ecological health of the island is better with a large, lumbering, introduced new inhabitant than without. In the Seychelles, the quarter-tonne beasts have quite an impact. They make burrows; and some of the land is now covered in what's termed "tortoise turf", where more than 20 species of grasses and other plants grow together - some having evolved to produce seed low down their stems, better placed to avoid the animals' chomping jaws. And - an important issue for an island introduction - they can swim. But take them away, and perhaps the ebony's fate will be sealed. So do they stay or do they go? Hope you enjoy chewing this one over! Re-homing nature: A step too far? Sir Richard Branson's plan to introduce lemurs to islands he owns in the Caribbean, which I reported on Saturday, has thrown into new light a real dilemma facing conservation scientists as they struggle to contain and reverse the loss of species and ecosystems across the world. 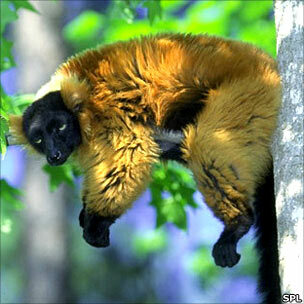 Lemurs are Madagascar's most iconic animals, very old in evolutionary terms and seriously enchanting to the human eye. And they're seriously threatened - some species more than others - principally by deforestation. As always, the first requirement for effective conservation is the effective rule of law. And many reports indicate that since the overthrow of President Marc Ravalomanana two years ago, the country's civil turmoil has resurrected the climate of opportunistic environmental plundering that the deposed leader had done much to curb. With some lemurs now facing extinction in the wild, what would be more natural than to think of taking some of them somewhere else - in Sir Richard's words, "giving them a new island" - where they can live in peace and tranquility? At first sight, it's a solution that could be implented on a wide scale. Indonesia alone has about 7,000 uninhabited islands - why not set up a scheme that distributes imperilled plants and animals from southeast Asia between them, for example? If something seems simple and straightforward, there's usually a reason why it isn't being done already. And in this case, there are several. There's a saying "marry in haste, repent at leisure"... and it appears to be especially true when the marriage is a forced one between components of different ecosystems. Well-known examples would include the introduction of the rabbit and the cane toad in Australia. But we can add birds and plants to Hawaii, possums to New Zealand, lampreys to the Great Lakes of North America, and rats on countless islands. "The damage done by harmful introductions to natural systems far outweighs the benefit derived from them. "The introduction and establishment of alien species in areas where they did not formerly occur, as an accidental or intended result of human activities, has often been directly harmful to the native plants and animals of many parts of the world and to the welfare of mankind." Introductions, it continues, have resulted in a few species coming to dominate a large number of ecosystems as they either eat, infect or out-compete the traditional inhabitants. "Islands, in the broad sense, including isolated biological systems such as lakes or isolated mountains, are especially vulnerable to introductions because their often simple ecosystems offer refuge for species that are not aggressive competitors." The guidelines - developed by the International Union for the Conservation of Nature (IUCN) - don't say "never do it". But they do say "tread carefully" - because obviously it would be hugely ironic if introductions with a conservation motive ended up doing damage. So far, species introductions have mostly been used over small distances, in situations where the original habitat has become impossible. 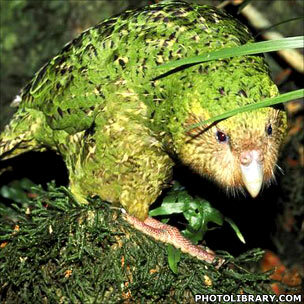 Several New Zealand birds, for example, such as the flightless kakapo, have been successfully introduced to islands off the coast after human expansion and newly-introduced pests meant they simply could not survive in their native lands. A particularly intriguing situation concerns the Kihansi spray toad, one of the world's smallest amphibians. It lived in a single waterfall. Now that habitat has gone - construction of a hydro-electric dam first dried up and then polluted the water supply, and introduced the lethal disease chytridiomycosis. Discussions are ongoing as to whether captive populations should be introduced to a similar waterfall, and if so, where; but certainly its native home is not an option, and perhaps never will be. But taking a species from one continent and "giving it another island" on the other side of the world as a place where it can live more or less in perpetuity - that is, as far as I can ascertain, unprecedented. The islands are Moskito (also written Mosquito) and Necker, in the British Virgin Islands (BVI), which Sir Richard owns. Clive Petrovic, a BVI ecologist whose CV includes contributing to global assessment of coral reefs and cataloguing local butterflies, led the Environmental Impact Assessment in 2007 for Moskito Island. "...in several places in the assessment we cautioned against non-native introductions." "You should realise that there are no lemur-sized mammals native to Moskito or Necker because the islands cannot support such large animals. Therefore, it is almost certain that lemurs would not survive long on the island without significant care and feeding. "Further, there are toxic plants native to the islands that could possibly harm lemurs, and at least two native raptors are large enough to prey on young lemurs. Also, the lemurs may negatively impact native birds or some of the rare reptiles and that could become a problem." At least a dozen species of bird nest on the island, he said; and some lemur species are partial to eggs. Dr Petrovic was at pains to point out that Sir Richard has been ecologically an excellent custodian of his islands, and has gone to great lengths (and expense) to conserve and improve the environment. Sir Richard also told me that if problems were to arise - if lemurs started eating the dwarf gecko, for example - he would take measures to deal with that. However, even if these local impacts can be dealt with, then if Clive Petrovic is right and the island can't support lemurs without constant human intervention, one has to ask whether this project really meets the criterion of giving the animals another island. It would, however, meet another aim of Sir Richard's - to give captive lemurs a better home than the ones they currently have in cages in zoos. We're not talking about all zoos here; but some he's targeting do appear to be keeping animals in less than optimum conditions. But that's an animal welfare issue, not a conservation issue. The potential biological impact is only one reason why conservation scientists tend to regard species introductions as a last-ditch measure. Iconic animals such as lemurs are seen as ways of leveraging money and political pressure that can be used to conserve the whole native ecosystem. Some of the activists who began campaigning to "Save the Whale" all those years ago were actually interested in the entirety of ocean life, but used whales as a flag around which governments and ordinary folk could rally. So it is with lemurs. Use their iconic value to save the Madagascan forests, and you also preserve the entire ecosystem, not just its cuddliest component; that's the argument. So there is concern about the potential impact of sending a message - however unwittingly - that could be taken as meaning "the animals are OK because now they have a second home". Some also find it a difficult ethical issue. Who are we, they argue, to distribute species around the planet according to a set of criteria that we develop ourselves and which may well contain a deal of anthropocentric reasoning? The counter-argument is that we've been redistributing species as long as we've been travellers, and have wrought more profoundly damaging change - usually by accident - than anything we're likely to do through the unintended impact of conservation programmes. Yet more opposition comes from the idea that there's obviously a limit to what species introductions can achieve. Could we, for example, take the endangered snow leopard and find it a couple of uninhabited islands, perhaps in the Canadian Arctic? To where should the northern black rhino be transplanted? As summer sea ice in the Arctic becomes a scarce commodity, are there any uninhabited islands around the Antarctic that could take on some polar bears? And what about the oceans - how does the notion of second homes work there? So - the argument goes - let's just set this limited and problematic idea to one side and concentrate on the fundamental aim of conserving places where the animals actually live now, and to which they're optimally adapted through millennia of evolution. There will doubtless be readers who take the view: "yes but we've still got to do something", and would applaud Sir Richard unreservedly for offering sanctuary to some of these undeniably charming and fascinating creatures - and perhaps wish that other people would similarly get off their richly-caveated backsides and actually do something. And I'm sure everyone concerned about nature would wish him well with the venture. "Haven't these guys seen Jurassic Park?" And while that over-dramatises the situation, the wider issues demonstrate that saving nature is about far more than giving it a new home. 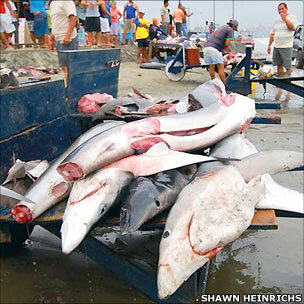 Just how .......d are the world's oceans? I've put the dots in that sentence so you can insert the word of your choice. According to a high-level seminar of experts in Oxford earlier this week, there's one word starting with the letter S that would fit quite well, a longer option beginning Kn - and a few more that are even stronger in meaning. The S option, by the way, is not "secured". Scientists are famous for staying in silos and never peering over the edge at what's going on in the world around them. What marked this week's event - convened by the International Programme on the State of the Ocean - as something a bit different was the melange of expertise in the same room. Fisheries experts traded studies with people studying ocean acidification; climate modellers swapped data with ecologists; legal wonks formulated phrases alongside toxicologists. They debated, discussed, queried, swapped questions and answers. Pretty much everyone said they'd learned something new - and something a bit scary. Warnings on the impacts of issues such as overfishing, pollution and habitat loss aren't new. With some of them, scientific findings have translated into a pressure for change, and indeed to actual change - as seen this week, for example, with the European Union's adoption of new rules on illegal fishing. But the various threats tend to be considered in isolation. By contrast, the idea behind this project is to look at what happens under a combination of threats, and ask what this more comprehensive picture demands in the way of policy changes. It's fairly well-known now, for example, that the impacts of climate change on coral reefs can be delayed by keeping the reef healthy - by preventing local pollution, keeping fish stocks high and blocking invasive species. So a policy to reduce climate impacts can mean curbing fishing or pollution, which might in turn mean changing farming practices to prevent fertiliser run-off. In places, filter-feeding fish are apparently living in sediments containing so many particles of plastic that it makes up half of each mouthful. Other pollutants such as endocrine-disrupting ("gender-bending") chemicals gather on the plastic surfaces - which obviously can be harmful to the fish. So a "healthy fisheries" policy might again involve regulating pollutants. If the ways in which these various threats combine was a central theme of the seminar, another was the way in which trends appear to be speeding up. Many researchers noted that in their field of study, the pace of decline and degradation exceeded even the worst projections made just a few decades ago. The conclusions of the seminar will be released later this year. 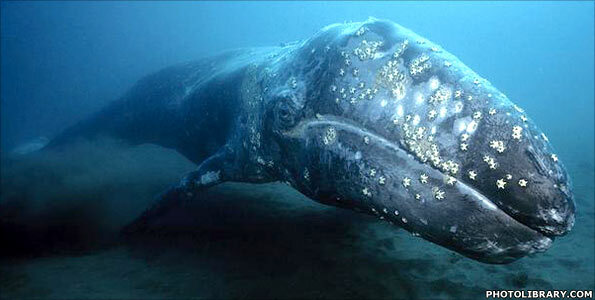 One of the aims is to get some serious commitments on ocean issues at the Rio+20 summit next year. And here lies the biggest challenge for this project - especially in a world where the number of "other Cassandras", to use a phrase from the JM Kaplan Fund's Conn Nugent, appears to have grown way beyond the public's appetite for messages of doom. For scientists, the route from research findings to policy change can appear simple. They tell politicians and the general public how it is, the public gets concerned, and politicians then reform the system so as to halt the destruction - partly because it's the right thing to do, partly because the public is telling them to. Barry Gardiner MP, a leading light in the Globe International organisation of environmentally concerned parliamentarians and recently appointed as Labour leader Ed Miliband's special envoy on climate change, gave the scientists a condensed and forceful lesson in political realities. Of 650-odd MPs in the UK Parliament, he said, there are perhaps 50 who would have any reason to pay attention to global tales of ocean decline; and only perhaps 10 who would find a political motive for taking up such an issue in the House. "There has to be a level of political engagement, and that engagement has to be not by scientists coming with the best analysis there is and wagging your fingers and saying 'now go and get this sorted out', because no politician listens to this," he said. "You've got to listen to the politician and what his problems are, and them come with solutions." "...makes you feel like a moron... what keeps politicians from operating with proper minds?" "...driving towards the edge of a cliff while taking copious notes along the way. "For years the science has gotten better, and the problem has become worse. Better science will enhance our understanding of the dilemma we face but will not resolve it - we depend on government to do that, and the challenge we face is getting government to act." When the final report is written, its conclusions are likely to include (however worded) a warning that the oceans are in deep trouble, that decline is speeding up, and that impacts of this are already being felt. It will probably outline many dimensions of the issue, and make a comprehensive set of recommendations for politicians - and perhaps, for the public and the corporate sector. The major challenge, as always, will be getting the message heard and acted upon. For all the understanding of links between various threats out there in the oceans, the most important link is still between scientific findings and political action - and it's the one where progress remains most conspicuously lacking. More than 8,000km separate Vienna and Bangkok. That's roughly the distance that appeared to be separating the minds of people attending very different meetings that took place in the two capitals last week. In between bites of Sachertorte, scientists unveiled their latest research in many disciplines relating to the Earth - including climate change - at the European Geosciences Union (EGU) annual meeting. Betwixt pad thai and green curry, at this year's first session of preparatory talks within the UN climate convention (UNFCCC), delegates from the vast majority of the world's governments attempted to find a political route simultaneously acceptable to their masters and appropriate to the level of scientific concern. Reporting both accurately is a tough task, for different reasons. The EGU, which I attended, is formed of multiple parallel sessions at which new research is presented - there are so many that keeping track of everything is an impossible task. The UNFCCC, on the other hand, is a tangled political web that's pretty opaque even if you are present - which clearly, on this occasion, I wasn't. Those caveats given, here's my brief summary of the two meetings as they relate to climate change. Vienna saw lots of talk about ice, particularly the Arctic kind... and not much of it was optimistic. We saw new models of how quickly Arctic sea ice will melt, and new attempts to understand key mechanisms affecting the Greenland ice sheet. You may have read about Wieslaw Maslowski's renewed projections that summers will be free of sea ice within this decade. Not all modellers agree with that timescale... even so, the fact that it's on the agenda indicates the speed of changes in this most totemic of regions. I didn't have time to report on the Greenland modelling, but one of the packed presentations I attended saw a study indicating that the ice sheet could well reach a tipping point of melting at a global average temperature rise of only 1.5C (2.7F) from pre-industrial times. We are about halfway there already. I also dipped into sessions on methane releases from around the Arctic. This is a really tough issue to research, because historical records aren't good. So when ships monitor methane bubbling up from around Svalbard, for example, and wonder how important it is, there's no database that you can open to compare present day releases against those from half a century ago. Nevertheless, we heard that the water in some of these locations has warmed by one or two Celsius in the last few decades, and scientists presented simulations indicating how that may be affecting methane emissions. Hard data appeared in short supply - for the reasons I've given, plus the fact that this sort of research is hard and expensive. But I was accosted by one scientist who said his initial calculations indicate methane release could be serious enough to amplify human-induced warming 40-fold. OK... we're talking here about non-peer-reviewed science, for the most part - the rituals and rhythms of science mean conference presentations are habitually of non-published material. Even so, I trust this little tour d'horizon has given you a flavour of discussions and debates at what is a purely scientific gathering, with no politics and very small amounts of hype. Take a trans-continental jet over to Bangkok, meanwhile, and we see politics and science trading places. Those of you familiar with the UN process will know that for the last few years the official negotiations have been run along two parallel tracks - one dealing with the Kyoto Protocol, the other (named Long-term Co-operative Action, or LCA) with everything else. This was a week-long meeting, and the LCA group did not agree its agenda until the Thursday evening. From that, you might judge that not much was accomplished; and from what I've been hearing, you'd be absolutely right. There are now less than two years until the Kyoto Protocol's first commitment period - in other words, its first set of targets for reducing emissions - comes to an end. This is why developing countries are vehement in their assertion that their richer cousins need to get on with agreeing a new set of targets very soon. Business groups at the Bangkok meeting said the same thing. After all, if you were making investment decisions that might be financially affected by carbon targets, you'd want to know as far as possible in advance what those targets are going to be. Tuvalu and others demanded that rich countries should either say right now that they are going to agree further emission cuts under the Kyoto Protocol, or leave the room. This was aimed partially at Japan, Russia and Canada, which have said they won't entertain the prospect. But it was also presumably intended to draw out the final positions of those that have said they might, such as the EU, Australia and New Zealand. The EU then countered that they couldn't say yes or no until technical details of what a second commitment period might look like had been nailed down. And so the loop played round. that it will not do more without "symmetry"- i.e. unless China pledges pretty much the same thing. At this point in the cycle of talks, looking back to the last big summit (Cancun, in this case) and forward to the next one (Durban), there's often a deal of friction. Later on in the year, countries that want major progress on fundamental issues are often more or less forced to accept their demands won't be met, and in the ensuing "something or nothing" situation, to work alongside those whom at root they consider recalcitrant. So the political path may yet smooth out as the year progresses. But if the scientific picture is getting worse, as soundings at the EGU would indicate... what then? Do the politics reflect the new urgency that science appears to be generating? And if not, can they be reformed so they do - especially given the huge obstacles that materialise now, when attempting to agree measures that are acknowledged as inadequate by just about every party in the climate convention?